Share the post "SLASH Always Wanted To Be Part Of A Band: ‘I Didn’t Wanna Be A Solo Guitar Player’"
Guitar legend Slash has told Vancouver’s CFOX radio station that he prefers playing in a band to being a “guitar hero” type that is surrounded by hired musicians. As previously reported, the February 20 show by SLASH FEATURING MYLES KENNEDY AND THE CONSPIRATORS at Eventim Apollo in London, England was professionally filmed for future release. 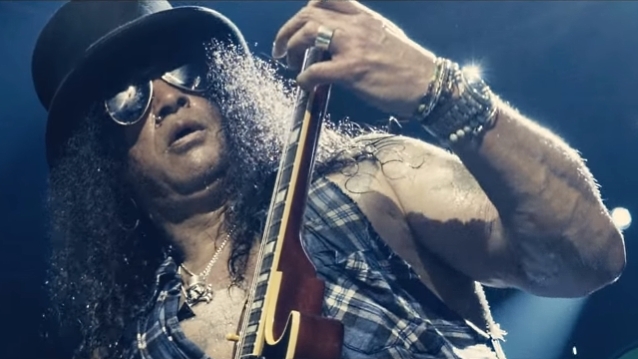 Slash‘s latest album, “Living The Dream”, was released in September via his own label Snakepit Records, in partnership with Roadrunner Records. “Living The Dream” is Slash‘s fourth solo album, and third with Slash and his bandmates Myles Kennedy (vocals), Brent Fitz (drums), Todd Kerns (bass and vocals) and Frank Sidoris (guitar and vocals). The artwork was created by renowned visual artist Ron English.